Stressing Manifest Destiny while exploring the history behind the United States' territorial expansion, Manifest Destiny and American Territorial Expansion focuses on the driving forces that impacted the growth of the nation and how the concept plays out globally. 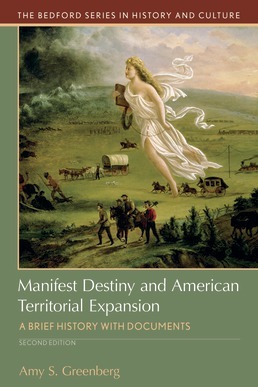 Covering the ideological origins, social and economic impetus, as well as territorial acquisitions that fueled U.S. territorial expansion in the nineteenth century, the text broadens your scope of this era by expanding on the early settlement of areas immedialy following the U.S. acquisition and the critical role of women in America’s territorial expansion. Combining all of these elements together, you'll get a complete picture of how Manifest Destiny impacted the country's history. Amy Greenberg (Ph.D., Harvard University) is Edwin Erle Sparks Professor of History and Women’s, Gender, and Sexuality Studies at Pennsylvania State University and an academic editor of the Cornell University Press book series, "The United States in the World." She is the author of three books: the award-winning A Wicked War: Polk, Clay, Lincoln and the 1846 U.S. Invasion of Mexico, Manifest Manhood and the Antebellum American Empire, and Cause for Alarm: The Volunteer Fire Department in the Nineteenth-Century City.